Islamabad: Lieutenant General Zaheerul Islam was on Friday appointed the chief of the powerful ISI by Pakistan government, ending months of speculation about a third extension to incumbent Lieutenant General Ahmed Shuja Pasha whose tenure ends on March 18. 56-year-old Islam, currently the military commander in Karachi, is considered close to army chief Gen Ashfaq Parvez Kayani. He served as Deputy ISI Director from 2008 to 2010. "Prime Minister Yousuf Raza Gilani has appointed Lietenant General Zaheerul Islam, Corps Commander Karachi, as the new Director General of the Inter-Services Intelligence," said a brief statement from the Premier's office. His appointment ended speculation about a further extension to General Pasha, who had been in the post since 2008 and got two extensions after reaching the age of retirement in 2010. General Pasha is now due to retire on March 18. 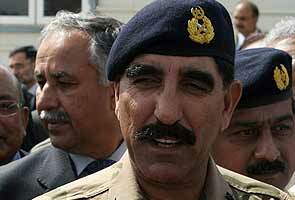 General Islam, who is due to retire in October 2014, comes from a military family of Punjab province. During his earlier stint in the ISI, he reportedly headed a section that dealt with domestic and counter-intelligence matters. In his capacity as the head of the Karachi Corps, General Islam played a key role in operations by security forces to control widespread ethnic and political violence in the financial hub of Karachi last year. In the past few weeks, media reports had said several generals were in the running for the post of ISI chief, including Major General Sahibzada Isfandiyar Ali Khan Pataudi, a Deputy Director General in the spy agency and an uncle of Bollywood star Saif Ali Khan. However, sources told Press Trust of India that General Islam had emerged as a front-runner several weeks ago after it became clear that both the military and civilian leadership were not keen on granting another extension to General Pasha. General Pasha had come under a cloud after US special forces mounted an operation to kill al-Qaeda chief Osama bin Laden in the garrison town of Abbottabad in May last year. He reportedly offered to resign during a special joint session of Parliament that was especially convened to discuss the raid against bin Laden. The current ISI chief also faced criticism for his role in the memo scandal that strained relations between the civilian government and the powerful military last year. General Pasha reportedly travelled to London without the permission of the government to meet American businessman Mansoor Ijaz, who made public the mysterious memo that had sought the US help to stave off a feared coup in Pakistan after the killing of bin Laden. Mr Ijaz subsequently told the media that General Pasha had toured several countries, including Arab states, to seek support for a military takeover in Pakistan. The military used Mr Ijaz's revelations about the memo to ask the Supreme Court to order a probe into the issue but dismissed his allegations that General Pasha had visited other countries to seek backing for a coup.